Objectives: Polycystic ovary syndrome (PCOS) is one of the frequent endocrine disorders among young females, which can cause infertility. Recently, evidence has shown the beneficial impacts of N-acetyl cysteine (NAC) use along with clomiphene citrate on the treatment of infertility caused by PCOS. Regarding this, the present study aimed to compare the pregnancy rate between the PCOS patients treated with clomiphene and those received clomiphene along with NAC. 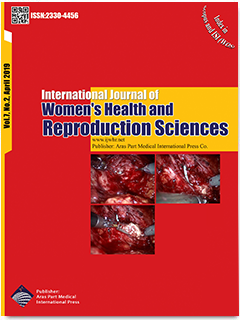 Materials and Methods: This blinded randomized controlled clinical trial was performed on 66 patients with PCOS who presented with infertility at Milad Infertility Center in Mashhad, Iran, in 2015. The patients were divided into two groups of intervention and control using a random number table. In the intervention group, 100 mg of clomiphene (i.e. two pills) along with 1200 mg of NAC (i.e. two 600 mg pills) were given to the participants from the third day of the menstrual cycle for five days. In the control group, 100 mg of clomiphene was administered from the third day of the cycle for 5 days. The patients’ response to medications as well as the number and size of follicles were assessed using the vaginal ultrasound. Results: The 2 study groups had no significant difference regarding age, duration of infertility, body mass index, history of infertility treatment, and endometrial thickness on the third day of the menstrual cycle. The mean endometrial thickness was 7.47 ± 1.6 (NAC/clomiphene) and 7.58 ± 2.1 mm (clomiphene) on the 12th day of the menstrual cycle (P = 0.810). Furthermore, the mean sizes of the follicles were 13.6 ± 4.2 (clomiphene) and 15.9 ± 5.1 mm (NAC/clomiphene) (P = 0.301). The mean numbers of follicles were 1.56 ± 0.9 (clomiphene) and 1.8 ± 0.9 (NAC/clomiphene) (P = 0.069). In total, 7 (21.2%) and 5 (15.1%) patients in the intervention and control groups had a positive beta-hCG result, respectively (P = 0.260). Conclusions: As the findings of this study revealed, the addition of NAC to clomiphene treatment was not associated with an increased chance of pregnancy in patients with PCOS-related infertility.